What's happening in your yard? I'm beginning to hear reports from across the country how spring is finally making an appearance. Share your observations via Nature's Notebook, on our Facebook page, or on Twitter. We love hearing from you! Here's what's happening in my yard...once my grapefruit tree began to put on leaves in February, I really got into watching it. I watched flower buds swell for what seemed like an eternity. I dutifully checked the tree every day (and submitted observations via my Nature's Notebook mobile app daily!) until I finally witnessed open flowers on March 16. My observations, as seen via the Nature's Notebook data visualization tool, clearly depict this transition from "no" open flowers (grey vertical bars) to "yes" open flowers (purple vertical bars). Because I observed "no"s prior to a "yes", we can pinpoint with great accuracy when flowers were first open on my tree this year. I'm excited to see how this will compare to next year's observations! Observations from my grapefruit tree in Tucson, Arizona in spring 2014. You can view your data this way too - learn how. Thanks again for your support of Nature's Notebook. Looking forward to hearing what happens in your yard this spring! Who is tracking phenology where you live? 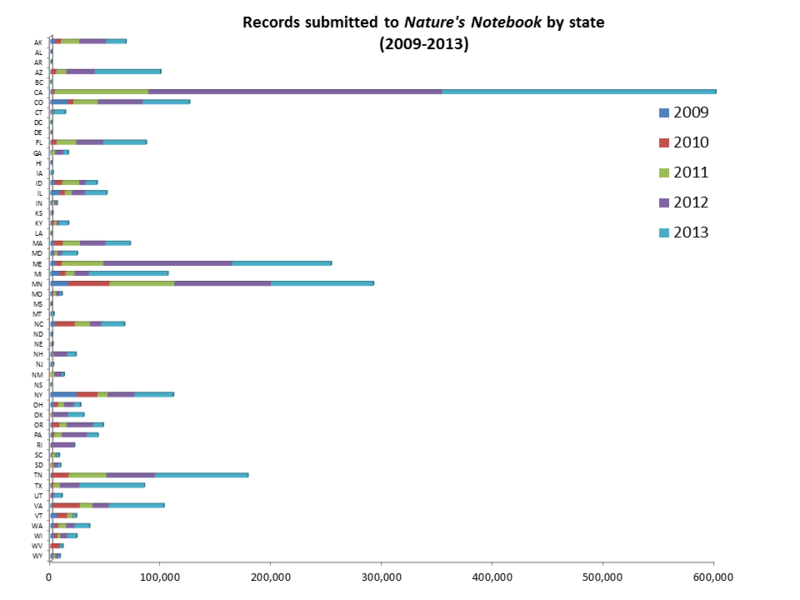 Since the inception of Nature's Notebook in 2009, the greatest numbers of observations have come from residents of California, Minnesota, Maine, Tennessee, Virginia, and New York. See how your state stacks up by clicking here or on the graph at right. Check out the other Nature's Notebook webinars planned for 2014. If you missed any of the webinars that we've already hosted this year, you can view the recordings. This spring, we'll unveil five new accomplishment badges to earn in your Observation Deck. Earn badges by capturing "no" observations, participating in the PopClock project, collecting your first observation, and more! In a matter of weeks, we'll be unveiling a new resource to assist you in identifying plant parts and phenophases. I've had a sneak preview, and I'm expecting that this will become my new go-to resource for understanding the basics of botany - I hope it's that helpful to you as well! On March 31st, the Final Draft Report of the Working Group II contribution to the Intergovernmental Panel on Climate Change (IPCC) Fifth Assessment Report Climate Change 2014:Impacts, Adaptation, and Vulnerability was made publicly available. The findings are consistent with previous working group reports, and indicate that "warming has contributed to the overall spring advancement observed in the Northern Hemisphere." Phenology continues to be appreciated as an easy to observe indicator of plant and animal response to climate change. Have you joined a Nature's Notebook campaign for this year? If not, see what's available in your region. Be sure to sign to receive the campaign messaging! These messages are filled with recent findings, observation tips, and campaign-specific opportunities. You'll only receive these messages if you sign up for them. This is a change from last year; we're trying to send messages only to folks that wish to receive them. You can sign up to receive these messages in the right sidebar of the campaign pages on our website.